You are here: Home / 2019 / March / 27 / Exchanging Secret Information? Always Get A Non-Disclosure Agreement! Businesses that deal or hope to deal with one another often have to put security concerns to one side and share their confidential information. 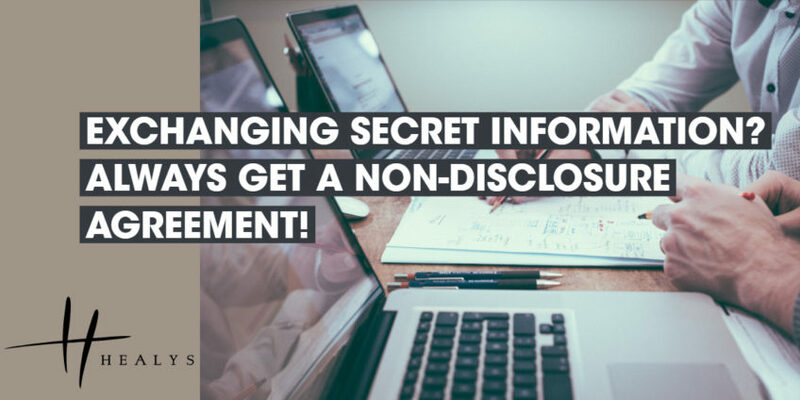 As a High Court case underlined, however, such exchanges should always be subject to a professionally drafted non-disclosure agreement (NDA). An American company that specialises in putting together insured financing deals hoped to enter into a commercial partnership with a Bermuda-based company in a similar field. In order to facilitate negotiations, the former disclosed confidential details of its trading models and pricing to the latter. The Bermudian company signed an NDA by which it agreed, amongst other things, to use the confidential information solely for the purpose of negotiating the proposed partnership. It also undertook to keep the information secret and to take all reasonable precautions to prevent unauthorised access to it. After the deal fell through, however, the American company became concerned that the Bermudian company would breach the NDA and use the confidential information to further its own business so that it could offer competing services at a lower price. As the NDA contained an exclusive English jurisdiction clause, the American company launched proceedings in London. In issuing an interim injunction against the Bermudian company, the Court found that the American company had established a serious issue to be tried. Damages would not be an adequate remedy if the NDA were breached and the balance of convenience also fell in favour of the order being granted. The terms of the injunction have yet to be finalised, but the Court indicated that the Bermudian company would, amongst other things, be required to return all hard copies of the document in which the confidential information was contained and to delete any electronic copies from its day-to-day operating systems.